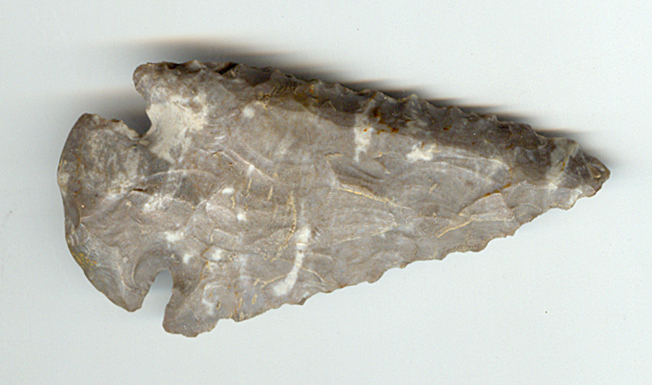 A Medium Size, Colorful, Very Well Made , St. Charles Dovetail Point That Exhibits Surface Sheen & Stone Aging Coloration Patina, Correct Rolled Basal Stem Edge Dulling, Aging In The Basal Stem Notches, Aged Mineral Deposits, Correct Style Of Flaking, Correct Blade Sharpening Reduction, Correct Material & Manufacture For The Area Found. Found By Bill Marlott. Several Sharpening Has Reduced The Blade Length And Width, Resulting In Steeply, Opposite Blade Beveled, Cutting Edges! Includes T & T Archaeological ( Grade 8 ) And Ken Partain Certificates of Authenticity!